Snippets of Jack: "You Can Kill Me But You Can't Insult Me"
"You Can Kill Me But You Can't Insult Me"
Jack still has his pride, even with a gun pointing at his chest. 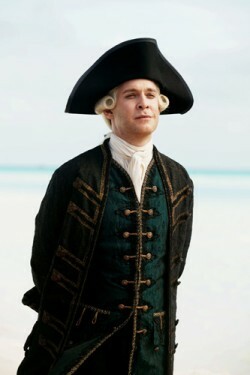 Although Cutler Beckett is 4 foot 2, he proves to be quite a threat in The Pirates of the Caribbean: At World's End. Beckett: "Jack, I just remembered... I have this magic compass that points to whatever I want. So what do I need YOU for?" Um, because Jack is awesome. Jack: "It points to the thing you want the most, and that is NOT Shipwreck Cove." Beckett: "Then what is, Jack?" Jack: "Me... dead." That's horrible. Who would ever want Jack to be dead? That compass is a very handy and powerful thing, that Beckett really wants. In The Pirates of the Caribbean: Dead Man's Chest Beckett imprisons Elizabeth and threatens her and Will with the gallows if he doesn't find Jack and bring back his compass. Personally, I prefer Jack over the compass, because I'm like Beckett. If I had the compass, it would just point to Jack! Although I don't think I'd kill him. "If I kill you, then I can use the compass to find my way to Shipwreck Cove. Cut out the middle man as it were." Jack: "Without me, you'd arrive at the Cove and find it a fortress, nigh-impregnable, able to withstand a blockade for years. Then you'll be wishing 'Oh, if only there was someone I hadn't killed inside, to make sure the pirates come OUTside...'" Beckett: "And you can do this?" Jack: "You may kill me, but you can never insult me. Who am I?" That awkward moment when Beckett doesn't know. "I'm Captain Jack Sparrow!" Duh! Who else? Jack's sense of humor is quite hilarious in this scene. I'm sure that is exactly what Beckett will say when he arrives at Shipwreck Cove, were all the pirate lords shall be meeting. Keep in mind that Jack is still fleeing his debt to Davy Jones, who has to listen Beckett because Beckett has his heart. How touching. So they come upon an agreement. Jack will lead them to Shipwreck Cove, and hand the East India Trading Company Will and Barbossa, and in return Beckett agrees not to let Davy Jones have Jack's soul. But because Jack is so great, he finds away to escape Davy Jones' wrath and manages to keep Barbossa and Will alive. He is neither killed nor insulted!